What's hilarious is that this guy can be a turn 4 or 5 play, haste included. At this point, without removal, you have 8 power on the field with Otepec Huntmaster, or 10 power with a souped-up Drover of the Mighty. 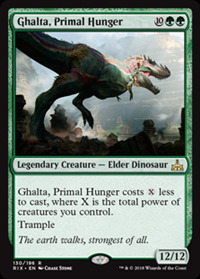 Turn 4 you can throw out a Carnage Tyrant (which is what my Dinosaur deck does now), or this guy, or do a turn 4 Tyrant and then a turn 5 Ghalta, Primal Hunger. Even leaves you plenty of mana to do a Heroic Intervention, since any smart opponent will kill this creature. Basically, unless your opponent constantly removes every single one of your creatures, casting this card for far less than its cost will be easy, and even giving him haste will be quite doable. A 12/12 hasty trampler coming out on turns 4 or 5? That's a must-answer situation, or the game ends very soon afterward. Love it. You don't stop playing to win even after you drop Regisaur Alpha, though. The Dinosaur deck thrives on putting out big threats. Carnage Tyrant may be a more practical turn 4 play following Regisaur on 3, but you can't let off the gas. And Ghalta is very playable — you're not really having to set up an easily-disrupted combo or anything to make Ghalta doable. He is made playable by doing what Dinosaurs are already doing, and he's a huge threat. I don't think Ghalta is really a "win more" kind of play. He's legitimately something you can cast early, and if not answered, puts the opponent in a losing situation. What do they use removal on? Your enablers? Regisaur Alpha? Ripjaw Raptor? Ghalta? Seems a bit too "win more" and too vulnerable to removal. If you have a turn 3 regisaur alpha then he's not really needed. is this better than convoke? Sure seems like it. I would have preferred hexproof to trample. If they board wipe you before or after you play it, this is a dead card. I'll pass. Anyone else hoping there's a cycle of Elder Dinosaurs for each of their three colors? A "Primal" white Dinosaur and red Dinosaur would be pretty badass. This comment reminded me of "Primal Rage." Somehow this is the only big beefy commander that turns sideways in monogreen's lengthy and illustrious legacy of big beefy commanders that turn sideways that I would actually enjoy playing. I think it's mostly because it has scaling casting cost reduction and 11+ power, which are both huge boons in commander that together turn a big dumb fatty into something with hidden depth.